Do you see it? Keep looking, you'll see it. Let's say that you're interested in a higher-end crop sensor camera from Nikon. You have your choice of 12.3mp, 16.2mp, and 24.1mp, at US$900, US$1000, and US$1200 respectively. 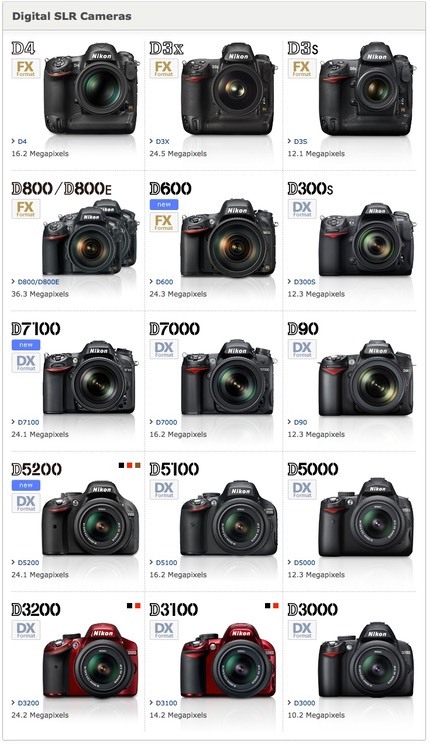 In fact, here in the US, the official prices for Nikon DSLRs still considered "new" are (some are kits only, some are bodies only): US$550, US$600, US$700, US$800, US$900, US$1000, US$1200, US$1700, US$2000, US$2100, US$3000, US$6000, and US$8000. Basically something at every possible price point (though I'll have more to say on the US$2000/2100 price point shortly). Nikon is making lemonade. They overstuffed the channels starting in 2010 (otherwise we wouldn't still have the D90, D3000, and D5000 still listed as current cameras in various Nikon sites). They continued to do that right through the present. So what we now have is a three-generation choice sitting around on shelves. What should scare the living daylights out of Nikon is that their best selling DSLR at retail early this summer was the three-year old D3100, not the one-year old D3200. Someone in Japan sitting behind a desk might be pleased with that ("we're unloading inventory"), but what I see is that people are buying a US$100 less expensive camera with fewer features and less performance than the current entry-level camera. Put another way: offer that entry buyer a significantly updated camera for US$100 and they aren't taking it. The same thing seems to be true at all of the consumer levels: people are buying on price, not latest-and-greatest. Nikon's not the only one with this problem. Canon, Sony, and Pentax have the same problem in varying degrees. The problem is simple: basic iteration tactics are no longer working well. The "upgraders" are becoming fewer and the new-to-market folk are becoming more price sensitive. As I've been writing for awhile now, the market has matured and in order to get another burst of sales growth the camera companies will actually have to do something distinctive and disruptive, something that makes everyone want a new camera again. Last Camera Syndrome is upon us.